On the continent, rabbit is regarded as nutritious and appetizing. In the UK we’re more hesitant, cherishing childhood memories of pets and the Easter bunny. Rabbits are generally sold whole, skinned and gutted – if you can’t quite overcome your squeamishness, ask the butcher to joint one for you. Joints of rabbit include loins, legs, rib, belly, neck, shoulder and saddle, and the kidneys are delicious. Often described as a stronger version of chicken, rabbit has a slightly sweet, vaguely gamey flavour and a pleasant texture, with wild rabbit having a much deeper flavour than farmed. Wild rabbits can be soaked in cold water for 3 hours to whiten the flesh if preferred. Look out for plump, pink rabbits that smell nice and fresh. If the rabbit has the head on, check the eyes - they should be bright and clear. Rabbits with bruised flesh or a lot of lead shot damage should be avoided - this meat will have an unpleasant bitter flavour. If the rabbits still have the kidneys in, check to make sure they have a good amount of white fat surrounding them - this indicates a younger, healthy rabbit that has had plenty of food throughout its life. The RSPCA and other organisations have recently been pushing to raise awareness about inhumane treatment of some farmed rabbits, which is an increasingly common problem in this country. Ask your butcher or gamekeeper about the providence of the rabbit - if it is farmed, make sure you find out about where and in what conditions it was raised, and only buy rabbit from the UK. On the other hand, wild rabbits have a completely free-range lifestyle, more flavour and are in plentiful supply - a bit of a no brainer! Rabbit is usually roasted, baked in a pie, or braised in a stew or casserole to keep the meat nice and moist. Its gamey flavour makes it a popular ingredient in terrines, rillettes or pâtés, while rabbit ragu makes a delectable pasta sauce. For something a bit different, add rabbit meat to a curry or mince it to make burgers. Bring chilled rabbit up to room temperature before cooking and keep in mind that this lean meat is prone to drying out, and always rest before serving to retain the juices. 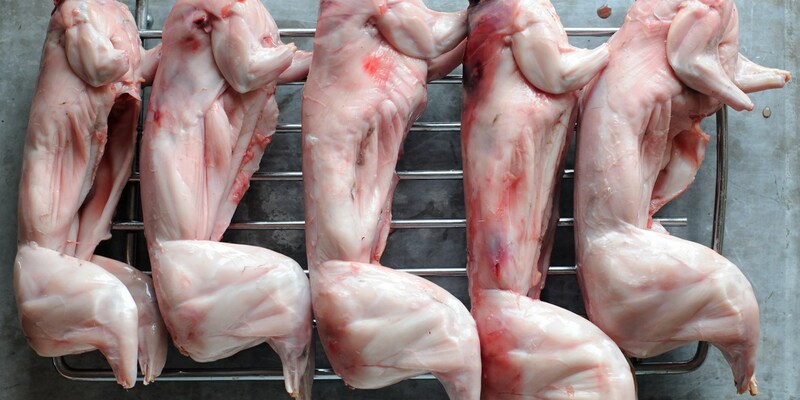 Young rabbits are suitable for roasting, while older ones need slow cooking. As with all game, check the meat for lead shot before and after cooking. Always ask for the liver, heart and kidneys of your rabbit - these delicious giblets are great for terrines, and beautiful when lightly fried and served in a warm salad. Slow cooking is ideal for tough cuts of meat, bringing out intense flavour and leaving you with a soft, succulent finish. Slow cooking is ideal for tough cuts of meat, bringing out intense flavour and leaving you with a soft, succulent finish. These methods are usually employed to slowly tenderise rabbit for stews, casseroles, ragus and terrines. Notoriously tricky to cook, the lean flesh of rabbit can result in dry, tough meat. Slow cooking rabbit is one of your safest bets for a good result – cooking at a low heat over long period of time, submerged in a liquid, is great for bringing out the best in this delicate meat. Its a good idea to brown the meat prior to slow cooking – this helps to caramelise the rabbit, which adds richness and colour. Rabbit is a very lean meat, but any part of the rabbit is suitable for slow cooking, as their energetic lifestyles means that practically every part of their bodies is well-used. This makes rabbit meat high in connective tissue, which can be tough if cooked quickly, but will break down when cooked slowly. Matthew Tomkinson recommends leaving the rabbit to cool in the braising liquid before reheating later in his rabbit cannelloni recipe – this allows the meat to retain the optimum amount of liquid, keeping it from drying out. Always make sure your meat is flaking off the bone before leaving to cool. Rabbit can also be confited at a low temperature of around 150°C in oil or duck fat ensures that the meat stays succulent and doesn’t dry out. Rabbit can also be cooked quickly, but ideally needs to be jointed first, as each cut requires a different cooking time. Cooking rabbit is similar to chicken, fry on a moderate heat for 20 minutes or so until the internal temperature reaches 71°C. Ideally, only quick-cook the lean, tender cuts of rabbit, such as the saddle or the loin - the other cuts are much more suited to pot roasting or braising. How long rabbits are roasted for depends on the joint, but as there’s little fat on them the flesh doesn’t need cooking for long. Many recipes require a quick sear or pan-fry before a short roasting time in a hot oven. Because it is such a lean meat, roasting rabbit on the bone is preferable to keep it moist and to enhance the flavour. Always allow the meat to rest properly before serving to retain as many juices as possible. Rabbit is often enjoyed on the continent in a rabbit stew, as in coniglio alla cacciatora and lapin a la cocotte. Often described as a ’peasant dish that’s fit for a king’, rabbit stews of this kind utilise the most humble of ingredients to create bold, flavourful dishes. Flavours commonly paired with rabbit include garlic, rosemary, sage and prunes as well as other meats such as salty ham and pancetta. It can also be enlivened by a tangy mustard dressing, and suits cider and cream-based sauces very well. Sicilians sometimes eat rabbit with a savoury dark chocolate sauce, the richness of the chocolate marrying very well with the gamey meat. Because of its popularity in Italy, you’ll find many recipes for rabbit with, or wrapped in, pasta, or served with polenta. For a lighter dish, opt for side orders of green vegetables such as spinach, petit pois, asparagus or braised lettuce.